The most common statistical error in orthopedic research is a type II (or “beta”) error. This occurs when a study incorrectly concludes that there is “no difference” between the test and control treatment. Finding no difference does not always mean there is no difference. This chapter will review the different causes of type II errors and provide tips for avoiding these errors when conducting research and interpreting the literature. The prevalence of type II errors in orthopedic research underscores the necessity of more objective outcome measurements and randomized studies with large numbers of patients. The material in this manuscript has never been published in its current format. The authors did not receive any outside funding or grants directly related to the research presented in this manuscript. 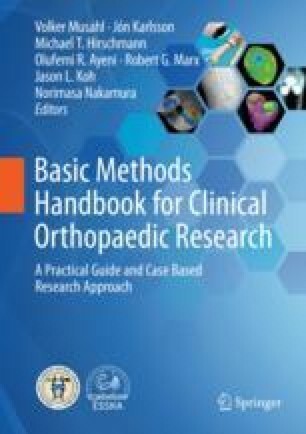 The Department of Orthopaedic Surgery from the University of Pittsburgh receives funding from Smith and Nephew, Depuy Mitek, ConMed Linvatec, Cook MyoSite, and Arthrex not directly related to the research presented in this manuscript. Dr. Freddie H. Fu is an editorial board member of AJSM and KSSTA.